The Worthington Dental Group invests in the latest technology to provide the best care for our patients. Cone-Beam is an advanced imaging technique of the dental structures in 3D. The use of 3D imaging results in precise accuracy in diagnosis and treatment. 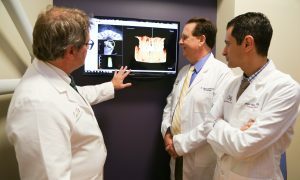 Cone-Beam 3D imaging minimizes surgery for implant placement. It enables us to know the precise size and exact placement for the dental implant. Without this 3D technology, the placement of a dental implant could be more invasive and require a larger surgical procedure.